The principle makes sense and making sure that cleaning is done nice and safely, with no issues like tripping over buckets or the wrong substance being consumed. The consequences can be horrendous and often easily preventable. You can go overkill with paperwork though and endless tick boxes. If these don’t match reality and what’s actually happening then you’ve missed the point. So here are 7 stages to get this right; deliberately designed to be as simple and usable as possible, whilst still applying basic safety principles, and providing helpful templates and downloads where applicable. These will help in whatever circumstances you’re in, not just purely business but others like at home where you have a mix of people helping out and you genuinely want a few things in place to ensure that friends and family are safe. Or in the volunteering sector which relies upon others mucking in, and some helpful guidance to make sure this is implemented correctly. Unfortunately of course there has to be some form of disclaimer here, with your own circumstances dictating any unique changes and application of these. But with these 7 pointers and some common sense you’ll soon get a long way. So here goes, the 7 core stages to make sure you cleaning is safe and compliant, including download templates to help where stated. The main type of insurance you’ll need is public liability to cover any accidents and claims by others, typical for most external cleaners you’re instructing. For cleaners though there may also be employers’ liability, contents, buildings, and even vehicle insurance to clarify and arrange. Even if you don’t believe new insurance policies are required, check that any current policies are sufficient to cover any related cleaning activities, and if there are any conditions to this. This is the mama of cleaning information, the main policy designed to provide an overview of how you shall safely carry out cleaning activities. Most businesses will need a Health & Safety Policy anyway, and cleaning can form part and parcel of this with a ‘COSHH’ element as well. This COSHH refers to the Control of Substances Hazardous to Health Regulations 2002 and is more an obligation to consider various aspects with potentially dangerous substances at hand. There are standard Health & Safety and COSHH policies available online or through suppliers, but the essential thing to note is that these need going through section by section and making sure that they apply to your situation. So adding extra parts where needed, or even removing those not applicable. So as an example, clarify what the actual procedure is for accidents and emergencies, including any emergency clean-up kit and accident form and First Aid kit. Ideally RIDDOR needs referring to as well as to how any serious accidents are then separately reported. Also don’t forget the actual premise you’re cleaning, and any day-to-day guides such as how to access the property and Fire Evacuation Procedures. If you’re dealing with food preparation areas like a commercial kitchen for example, then there may be additional cleaning requirements under the Food Hygiene Policy. And even more importantly are the people involved, so noting any disabilities and an effective Lone Worker policy for those cleaners potentially being on their own during cleaning duties. When you have all these COSHH and general Health &Safety issues clarified, you can then bottom out a final policy. Click here to see a sample policy for a voluntary organisation. In short, these are a summary of each individual cleaning substance that you’re using as an easy reference as to how to correctly apply, whether general issues like where to store and how to use, or in an emergency when there is say a spillage and accident. Whilst this includes obvious substances like bleach and cleaning spray, it may also need to involve less obvious ones such as hand wash liquid and washing-up liquid. The more popular substances tend to have standard manufacturer ones that you can locate from them or online, however it is still important to form your own summary to include additional more hands-on information as well as the technical manufacturer’s specification. Check out a cleaning Data Sheet template here. It’s a classic, and always will be it seems. This looks at your actual situation both at the building being cleaned and the processes and cleaners you have, and basically spots what could go wrong. 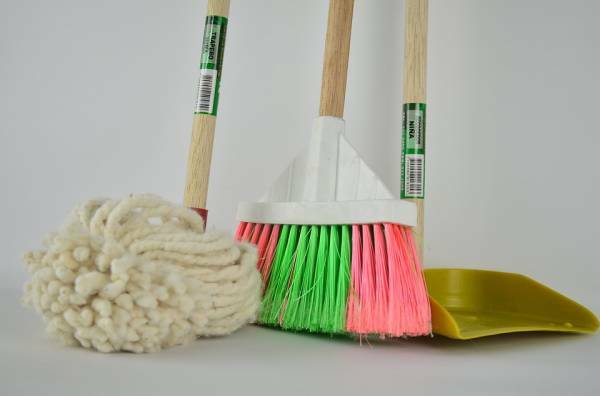 You can glean points from other standard cleaning risk assessments, and general issues in your above COSHH and H&S policy, making unique for different cleaning activities. But make sure these match reality, and you’ve chatted through what these actually mean with people. You’d be surprised how easy this is to do once you get going, as this all boils down to common sense and in today’s more health-and-safety conscious world people do tend to recognise these. So with a list of potential risks and resultant hazards and action points to hand, chat through with people and agree what the actual course of action needs to be. Then monitor going forward, making sure any action points are carried out (check out a sample cleaning risk assessment here). This is intuitive really, to show someone what needs doing and train them up. The majority happens anyway and on-the-job, however the challenge is to then document this and any issues arising from it. It’s helpful to have a checklist of the issues that need addressing, and to remember those important issues such as where the fire escapes are in the building, and the procedure for using PPE. Also, note when any refresher and further training is needed in the future, even if just a general chit-chat with everyone together and touch-base on things which is then recorded. Kind of along the same lines as well, it can be important to have clear instructions and guides as to how to carry out simple cleaning duties safely, maybe in a general manual and/or posted on the cleaning cupboard wall. Here's a separate post on how to train cleaners, with an induction-training checkllst and ongoing training summary to download. These are simple ways to communicate to people what’s happening and any dangers to be aware of. Examples include permanent ones such as for the cleaning cupboard and issuing any notices to warn users of the building to be aware (even standard letters and flyers can be useful). Also, any temporary ones used during cleaning, for example the yellow flip signs you often see on freshly-mopped floors to warn people. The icing on the compliance cake is a final schedule of things, ideally as short and simple as possible but still having the important issues being noted. So ideally a list of each cleaning task in a schedule or checklist which has a tick-box of, say, days of the week, or weekly and monthly time frequencies for cleaners to tick once completed. Also, a note of other important factors to log, for example any issues or accidents, and if any further cleaning stock and PPE items are required. Therefore, when bottoming-out how you need to get compliant with your cleaning, these 7 pointers will give you basics. They cover the spectrum right from basic insurance and policy covers, to how the cleaning is actually completed on site with signage. The templates and downloads above are a good starting point to then begin agreeing and documenting for your own particular situation, or there will be others available from the internet or reputable sources. The key then is how things are applied, and that you’re genuinely thinking through each point for your own cleaning situation and documented accordingly. The most comprehensive paperwork in the world will mean nothing if it clearly has just been copied from somewhere and not applied to your own situation.